It was the end of 1996, and Marvel Comics was not the financially secure publishing powerhouse that it is today. The company was facing bankruptcy, and its various money-making strategies of the past five years had all met with failure. Something had to be done - the company could not last much longer as it was, and other corporations were circling like vultures, ready to take advantage of Marvel at its weakest. Marvel had to cut costs. For months they had considered outsourcing their editorial duties to other publishers such as Wildstorm and Image Comics. The decision eventually reached by Marvel was not quite so final - they simply farmed out four of their titles to then-popular former Marvel creators Jim Lee and Rob Liefeld (both working with Image Comics at the time) for one year, in the hope that the creators' popularity would drive sales up. Of course, putting four titles central to the Marvel Universe in the hands of non-Marvel-based studios could have been a total disaster. There had to be some sort of safeguard, so that if the scheme did fail the company would at least be no worse off than it was before. The solution was Onslaught, and the start of Heroes Reborn. Since his debut in X-Men (vol.2) #50 almost nine months earlier, the monstrous entity called Onslaught caused nothing but trouble for the X-Men and, later, the entire Marvel Universe. The embodiment of Magneto's twisted anger toward humanity and Professor Charles Xavier's frustration at the plight of mutantkind, Onslaught at first seemed determined to wipe out humanity. With the help of several mutant agents, Onslaught was able to utilise a large number of mutant-hunting Sentinel robots as his personal army. While the Sentinels kept the Marvel heroes under control (and participated in several battles that led to the resignation of the Green Goblin as a superhero and the death of the parents of Hallie Takahama, who would later become the Thunderbolt named Jolt), Onslaught was free to further his plans, which included capturing and controlling Franklin Richards - the mutant son of Reed and Susan Richards of the Fantastic Four; Nate Grey (X-Man), an alternate reality's version of Cable, the mutant son of Cyclops and Madeline Pryor of the X-Men; and even Xavier himself. After a massive battle with the Avengers, the Fantastic Four and the X-Men, Thor managed to separate Onslaught from his mutant captives - resulting in Onslaught being bound by no sense of morality. He decided that both mutants and humans were equally unworthy of remaining on Earth, and all would be subjugated or destroyed by him. During another battle, Onslaught's physical body was destroyed, but this merely unleashed his true, nearly-omnipotent form which the villain used to create a second sun with the goal of destroying the Earth. The heroes soon realised that by entering Onslaught's energy form, they could contain bis power within themselves, but they also discovered that any mutants who entered Onslaught could be used by the villain. The non-mutant heroes - specifically the Avengers and the Fantastic Four - decided to absorb Onslaught's power and, once it was contained, offer themselves (and an unwilling Dr. Doom) as targets for the mutants to destroy. The heroes would be dead, but Onslaught would be destroyed. The sacrifice was made - and as far as the rest of the Marvel Universe knew, the heroes were gone forever. At the last moment, Franklin Richards used his own mutant abilities to shunt his family and the other heroes into an alternate universe. They had no memories of their pasts in the Marvel Universe, and were recreated as he remembered them. Many drastic changes to the status quo - such as the Wasp becoming an actual Wasp and Tony Stark being replaced by a teenage version of himself during the Crossing - were forgotten, and the heroes thrived on an Earth largely without mutants. That world was the Heroes Reborn world: a world not bound by the previous three-and-a-half decades of continuity, where the new creative studios to which Fantastic Four, Avengers, Captain America and Iron Man had been outsourced could do whatever they wished with Marvel's greatest icons. 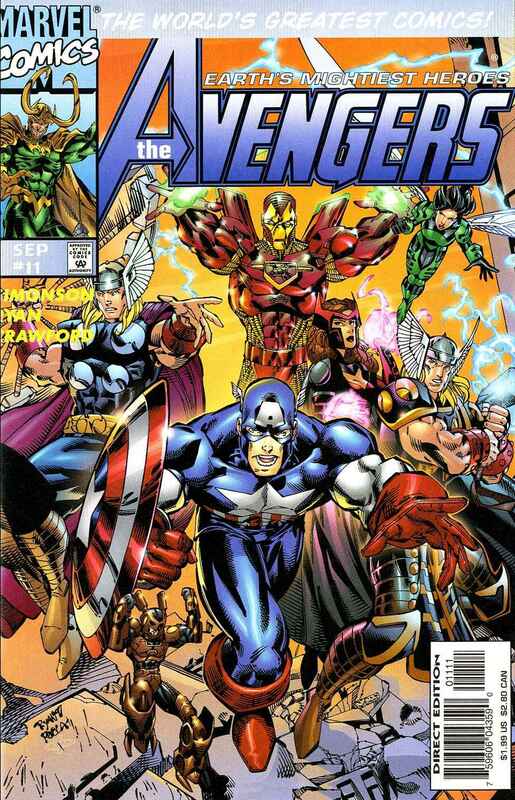 The team of Avengers that greeted readers in Avengers (vol.1) #1 came as a surprise to many fans. 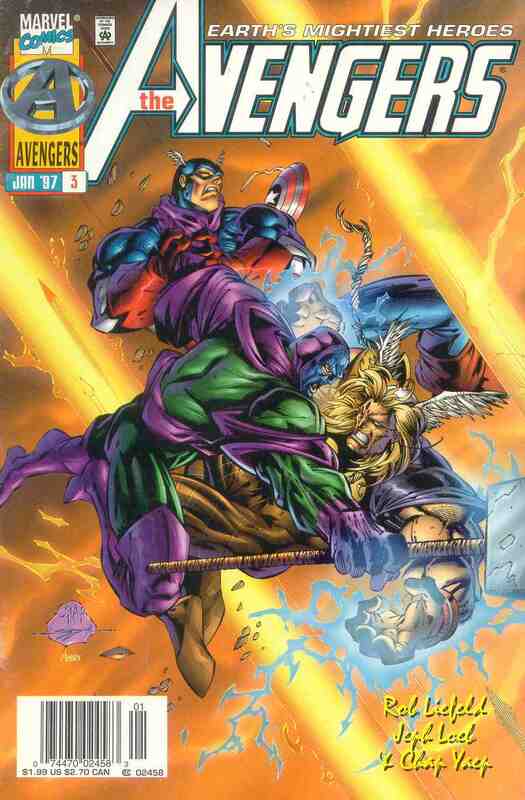 Many of the heroes who had been present at Onslaught's destruction were missing (such as the Falcon, Ant-Man and the Wasp) and two brand-new characters had found a home on the team (the Swordsman and Hellcar, with only obscure similarities to the original Avengers Swordsman and Tigra). The team consisted of Captain America, the Swordsman, Thor, the Scarlet Witch, the Vision, Hellcat and Hawkeye - a team very different from the one seen in the previous few years of Avengers stories! 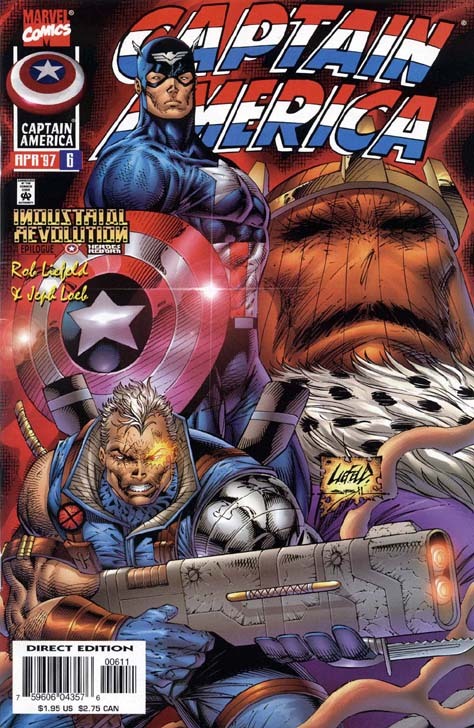 When the four titles were outsourced, both Avengers and Captain America fell under the supervision of Rob Liefeld, who set himself up as plotter and penciller of the series. However, after only six issues, Marvel attempted to renegotiate the terms of the deal with Lee and Liefeld, offering them a smaller amount of money for the projects. 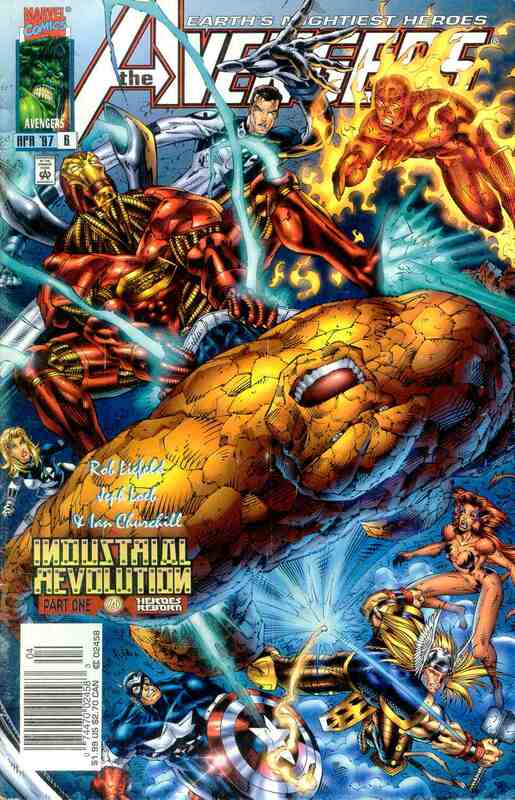 While Lee accepted the revised contract and continued his work on Fantastic Four and Iron Man, Liefeld rejected the new terms and his two titles were given to Lee. 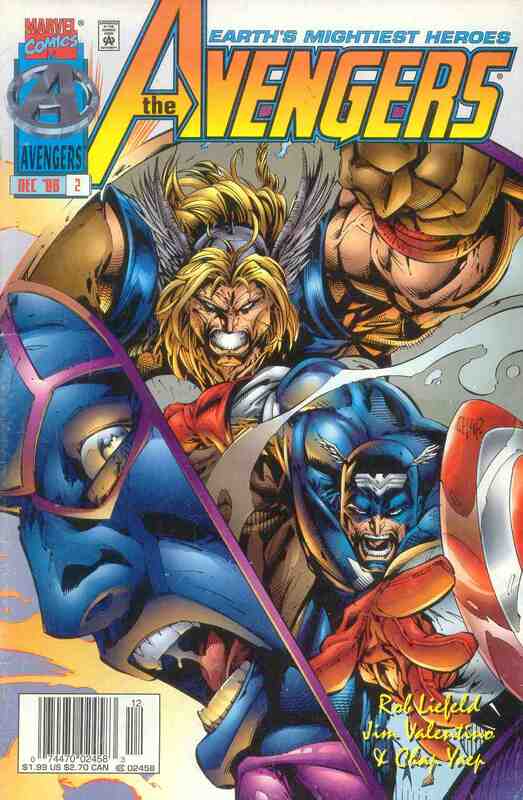 The issues plotted by Liefeld had been poorly-received by fans and Lee replaced the creator with writer Walter Simonson and penciller Michael Ryan, whose work was much more highly-regarded by Avengers fans both new and old. 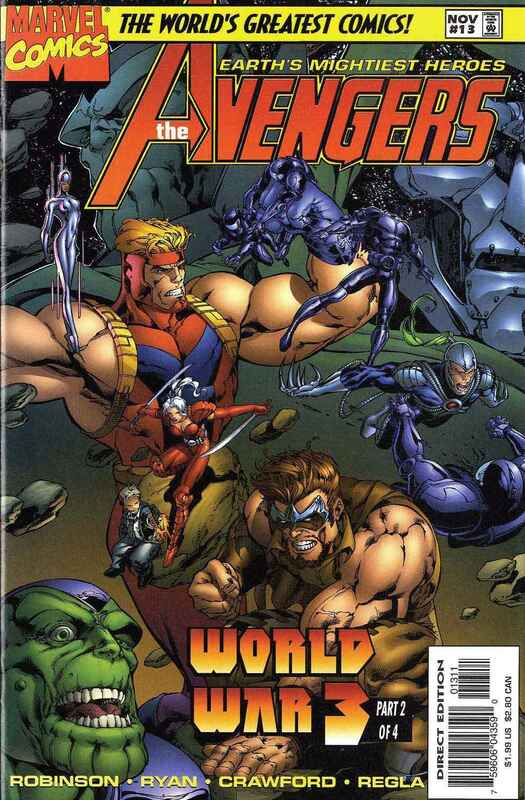 Rob Liefeld's characteristic obscenely long legs on women and massive chests and arms on men were not well-received by contemporary readers. The comic book market had been saturated by the style for the past few years and readers had eventually rejected it; that was one of the factors contributing to the financial difficulties that had led Marvel to outsource the titles in the first place. No doubt to maintain consistency, the artists that contributed to Liefeld's titles after his departure only made minor changes to the style. 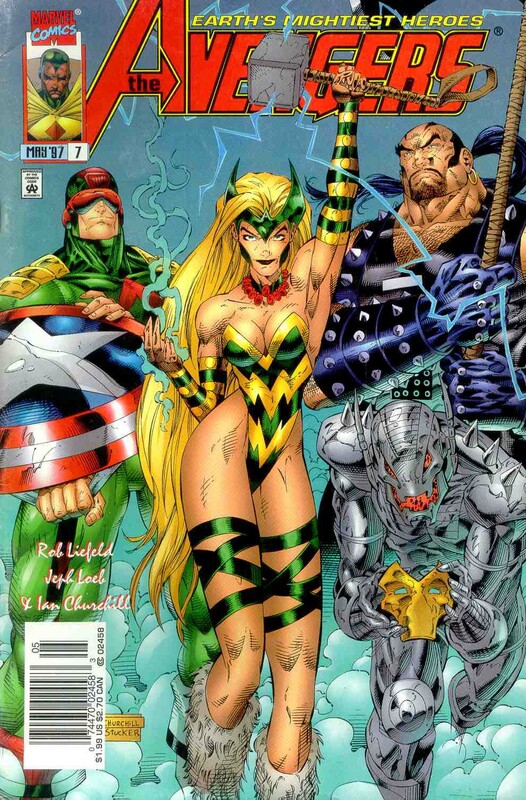 Critics of the Heroes Reborn event are often quick to point out the art style as one of its faults - however, it can be argued that Liefeld's style was ideally suited to the story. It had been established that the heroes has been recreated as remembered by the then-four-year-old Franklin Richards. When a four-year-old thinks of superheroes, what are they likely to remember? The oversized muscles and the bright colours, neither of which were missing from Liefeld's art or that of his successors. Similarly, recreations of his family's foes appeared as much more grotesque variations of themselves - a four-year-old remembering the terror he felt at seeing a foe would be likely to create a more twisted version of them! WILL THE REAL HAWKEYE PLEASE RAISE HIS HAND? #1 - Hawkeye feels unworthy compared to his peers, a problem Williams struggled to deal with for several years. #4 - Hellcat becomes focussed on what Hawkeye is hiding 'behind the mask' - Tigra once had an interest in Williams beyond his exploits as a superhero. #7 - Hawkeye seems to care for "Eric" the Reaper, and says "You're my only - !" - Simon Williams' brother is the villainous Grim Reaper, Eric Williams. #7 - Hawkeye was part of a mission against Zemo in Argentina - Williams received his powers from Zemo in South America, and later turned against the Baron. #7 - The Reaper is revealed to have died in Argentina, and Hawkeye feels responsible - the Simon Williams felt partly responsible for his brother's villainy and death. #1 - "Awaken the Thunder!" The issue begins in a very similar way to Avengers (vol.1) #1 thirty-four years earlier. Loki, the Norse god of mischief, is out to get revenge on his hated brother Thor. But this time, things are subtly different - it is suggested that Loki is actually from the original Marvel Universe - he remarks that the world resembles Earth, and that he had to journey there to find Thor. He also notes that Asgard never existed in that reality, and he remembers the names 'Blake' and 'Avengers'. Could he be the catalyst to unravel Franklin Richards' work? Realising that a lack of Asgard meant no Odin to stay his hate-driven hand, Loki set about finding and attacking Thor, who he located frozen in a chunk of ice discovered by a 'Dr. Blake'. However, Thor has been protected by a spell cast by the goddess Gaea, so Loki instead seeks out the Avengers, to bend them to his will (as he originally misled the Avengers into fighting the Hulk). The issue also establishes that the Avengers were set up, in part, to combat the machinations of the Atlanteans and their leader, Namor. 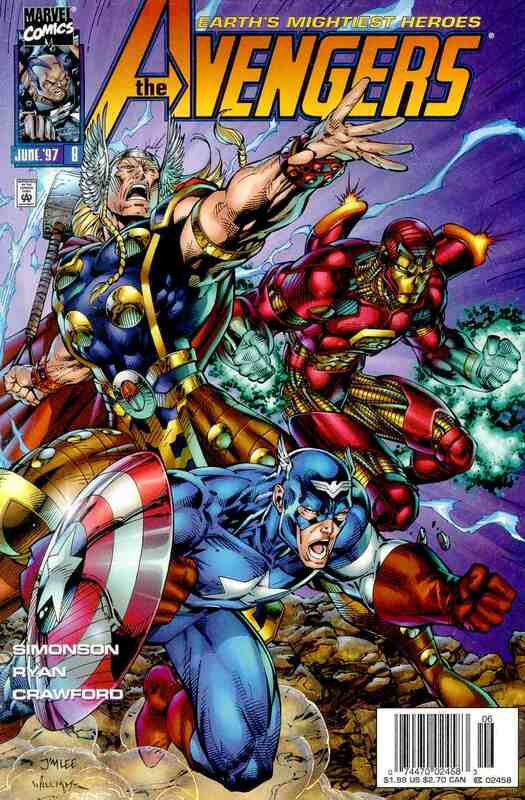 The Avengers are dispatched to investigate the discovery of Thor, and their combined power frees him. But Loki manipulates Thor into attacking the team, and it is only when Captain America throws himself between Thor and a backstabbing Loki that the god of thunder comes to his senses - and remembers an 'onslaught'! Thor joins the Avengers, and a well-cast hex by the Scarlet Witch sends Loki hurtling into an unknown dimension occupied only by the Enchantress - who claims to be the mother of the Scarlet Witch! The second issue opens with the Avengers' security liaison, Henry Gyrich, furious at the admission of Thor to the team. As he realises he has less control than he thought, the Scarlet Witch and Hellcat join their friend, Ms. Janet van Dyne, on a clothes-shopping spree. While shopping, they are alerted to a new threat - one which van Dyne does not join the others to fight. Meanwhile, Hawkeye and the Swordsman practice their combat moves against eachother, and just like in the original Marvel Universe the Swordsman acts as the archer's mentor! The Avengers gather to face the threat, which appears to be a UFO - and its occupant is none other than Kang the Conqueror! Loki and the Enchantress agree to work together against the Avengers and, simultaneously, Agatha Harkness - the Witch's guardian - feels that her charge is in grave danger. Kang defeats and imprisons the Avengers, and fights the Fantastic Four and SHIELD to a standstill - before finally revealing that he is doing it all for his beloved... Mantis! #3 - "In Love & War"
Kang continues to hold SHIELD off as he tries to prove to Mantis how much he loves her. Meanwhile, Janet van Dyne rushes to Avengers Island to see her lover, Hank Pym, and alert him to Kang's arrival. She loses her temper as Pym's robot assistant, Ultron, touches her arm (in the original Marvel Universe, Ultron developed an Oedipus Complex and tried to kill Pym and be partnered with van Dyne). Thor manages to free himself and the other Avengers, who prepare to attack Kang - even as a woman who appears to be Agatha Harkness enters the Avengers' HQ looking for the Scarlet Witch. In Massachusetts, the real Harkness wakes up to learn she is the captive of Loki. The Avengers defeat Kang, and when Thor and the Swordsman wish to kill their foe, Mantis offers her life for his. Captain America insists that the Avengers don't kill, and Kang and Mantis escape through time, with Kang suggesting that he will one day return. His ship blasts the Avengers, severely injuring the Vision. 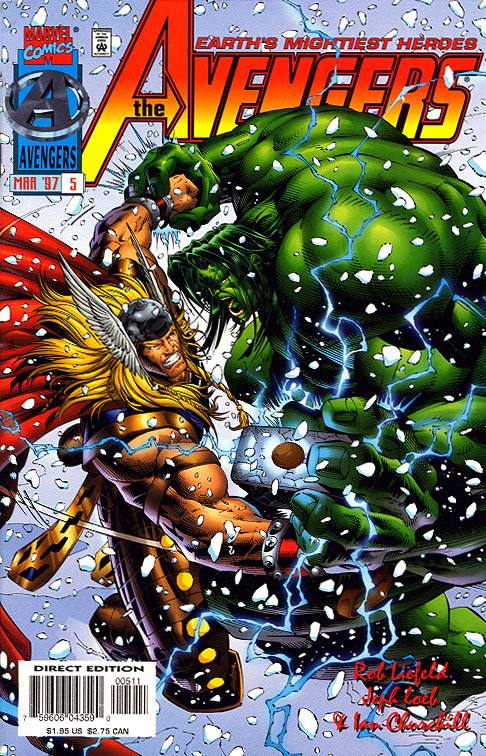 #4 - "That Which Gods Have Joined Together..."
SHIELD hunts the savage beast known as the Hulk! Back at Avengers Island, an upgraded Ultron assists Hank Pym as he shrinks - using his 'micron gas' - and enters the Vision, something he swears he has done somewhere before. Janet van Dyne enters, and after being horrified by Ultron calling her 'Janet', she asks where Pym is - and Ultron lies, telling her that Pym has left him alone to repair the Vision! The false-Agatha Harkness convinces the Scarlet Witch to leave with her, and her reflection reveals that she is actually the Enchantress. The Hulk attacks Avengers Island looking for his own alter ego, Bruce Banner, and defeats Hawkeye, Swordsman, Hellcat and Captain America! #5 - "... Let No Man Tear Asunder!" 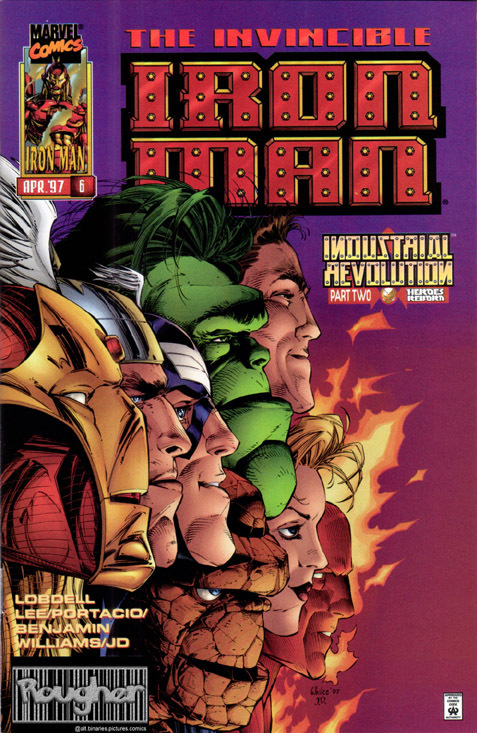 The Industrial Revolution crossover took place in Fantastic Four #6, Avengers #6, Iron Man #6 and Captain America #6 and dealt explicitly with the aftermath of the fight between Thor and the Hulk. #6 - "Industrial Revolution: Prologue"
Dr. Doom, fresh after helping the Fantastic Four defeat the Super-Skrull, is alerted by a Doombot to the near-destruction of Avengers Island. Doom realises that the Hulk is a potential source of massive power, and he decides to bide his time and, once his foes are vanquished, swoop in to pick up that power for himself! The Fantastic Four capture an intruder in their headquarters - and his name is Bruce Banner! Bruce is recognised by Reed Richards, and he explains to Richards that he just wants to use the FF's satellite uplink to stop the gamma core meltdown on Avengers Island that has been triggered by the Hulk. Meanwhile, SHIELD crews begin to extract the injured Avengers from the wreckage, and Loki begins to manipulate Nick Fury to help him finish off Thor. The FF arrives on Avengers Island and the Thing helps to care for a seemingly-dead Thor. Iron Man confronts SHIELD and threatens that if they and the FF don't stay away, he'll incapacitate their equipment. He arrives on Avengers Island and attacks the Thing, until he realises that the FF is with Bruce Banner, trying to repair the gamma core. Unfortunately, as the heroes come together to fix the damage, the stress becomes to much for Bruce and he once again become the Hulk. The assembled heroes contain the Hulk as they try to decide what to do next. On the SHIELD helicarrier, Loki pesters Fury, trying to cause the old warhorse to submit to his will. The Human Torch uses his powers to absorb away some of the radiation. Iron Man and Mr. Fantastic work on a scientific solution to the problem, while the Thing and a recovered Thor enter the core to see what they can do inside. Inside the core, Thor and the Thing succumb to the radiation, but are rescued by Iron Man. 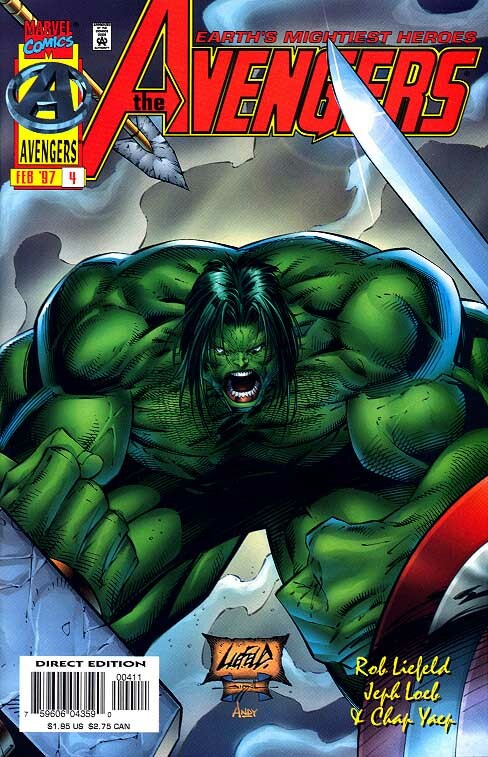 The Hulk enters the core alone and manages to seal off the radiation, but just for a moment Onslaught appears, but his appearance is dismissed by the heroes, who do not remember him. The heroes sadly leave the Hulk in the core, and the Human Torch unleashes the energy he absorbed - causing it to rain. Looking at the destruction around him, Captain America says that it seems the Avengers are finished, to which Iron Man replies: "Says you." #6 - "Industrial Revolution: Epilogue"
Iron Man, Thor and Captain America confront Nick Fury aboard the SHIELD helicarrier. Iron Man announces that it is obvious that SHIELD lacks the funding and skill to maintain the Avengers, so Tony Stark will take over the funding. Nick Fury protests, but the Avengers ignore him. Loki moans over how much he hates Earth, and watches as Agatha Harkness remains trapped within an oak tree. The Enchantress eventually appears before him and confirms that "all is in readiness", and the gods depart to begin their mischief. Meanwhile, the new Avengers return to Avengers Island to collect their personal effects, but Fury insists the Vision stays with SHIELD. Fury secretly admits that no-one knows where Pym is, but we see Pym inside the Vision, where the synthezoid's systems attack him and his first thought is of 'Jan'. In New York, Iron Man takes Thor to a mansion he has developed for use by the Avengers, and Thor is shocked at the lack of a manservant or butler. Back in Massachusetts, Agatha possesses the body of her feline familiar, Ebony, in order to find and help the Scarlet Witch. Captain America visits the unconscious Swordsman and bears his soul. He explains that while he knew the Swordsman thought Cap did not think very highly of him, he was wrong (in the original Marvel Universe, the Swordsman always felt that Cap never trusted him). Someone knocks at the door to the new mansion, and Thor is miffed at having to answer, swearing that he'll arrange a manservant by the end of the week. At the door he finds a man wearing red, green and gold, seemingly injured - but when Thor tries to help, the man attacks him and calls him a "Sucker!". It is Wonder Man (whose appearance in this issue is very similar to Avengers (vol.1) #9), who is soon joined by the Executioner, the Enchantress and Ultron-V - the Lethal Legion! When Iron Man wonders why the attackers were not recognised as hostile, a menacing Scarlet Witch appears and admits responsibility. Kang and Mantis are confronted aboard their ship by an unknown assailant, who converts them into pure energy. At Avengers Mansion, the Avengers confront the Lethal Legion. Eventually, the Avengers gain the upperhand and the Scarlet Witch spirits the Legion away, but they leave behind a defeated Executioner and Wonder Man. Captain America alerts SHIELD, which takes them into custody. Fury also agrees to let Cap question some old foes. Before he can get to them, though, the figure that attacked Kang and Mantis also takes away Cap's foes. The Avengers continue their fight with the Masters of Evil, and once again they win. According to Iron Man, they win a little too easily. They interrogate the villains, but learn nothing of value. Janet van Dyne appears and informs the Avengers that Pym is missing, and the Avengers go with her to help search. Once they are gone, Loki and the Scarlet Witch appear, and the villains are turned into pure energy with Loki feeds upon. Inside the Vision, Pym awakens and confirms what he saw - someone is siphoning data from the Vision's memory and transferring it to Avengers Mansion. Pym disables the siphon and leaves the Vision, where he is found by van Dyne and Iron Man. Fury confronts the heroes, but the Vision starts to smoke and build energy - the heroes depart, and hurl the Vision into the air, where he explodes. Pym insists Iron Man take him to Avengers Island, and they leave. Elsewhere, Thor moans over being on Earth, and is met by the Enchantress... with whom he begins to make out. Captain America visits the Swordsman in hospital, but learns that his friend has gone missing. He is recalled to Avengers Island by Iron Man. At the mansion, we are shown that it is Loki who has been siphoning the Vision's memories, and it is from there that he learned the true nature of the Heroes Reborn world. The Scarlet Witch betrays Loki, but he stops her and contains her. He also offers Hellcat the Witch's body, if she will serve him. 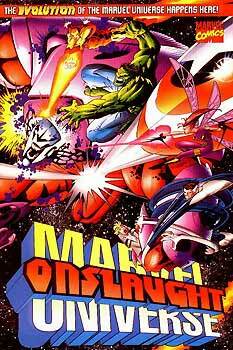 On Avengers Island, the heroes visit the gamma core and see images of the Super-Adaptoid, the Grim Reaper and the Living Laser, similar to the image of Onslaught they saw earlier. Iron Man described the energy given off by the core as being like a 'crack in the universe'. The images fade, but are replaced by a tangible image of Thor - a Thor whose costume is like that of the original Thor, not the Heroes Reborn Thor! The new Thor seems convinced that he has entered Valhalla. He recognises the Avengers, but notes that their costumes are different than he remembers... and Captain America recalls a slightly-different Thor. Thor also has vague memories of the battle with Onslaught. Elsewhere, Loki confronts Hawkeye and invites him to join his team - when Hawkeye doesn't say 'yes', Loki sends the Scarlet Witch to him... but it seems her body contains the spirit of Hellcat! 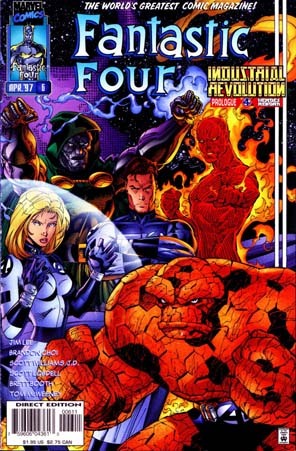 The Avengers visit Reed Richards, who confirms that the gamma core is acting as a bridge between realities and that different figures within the Heroes Reborn world come from different universes. Meanwhile, Loki convinces the Thor (who debuted in #1) to join his team. In Peru, SHIELD finds Kang's ship and reviews its records, and Fury departs to inform the Avengers of Loki's machinations. 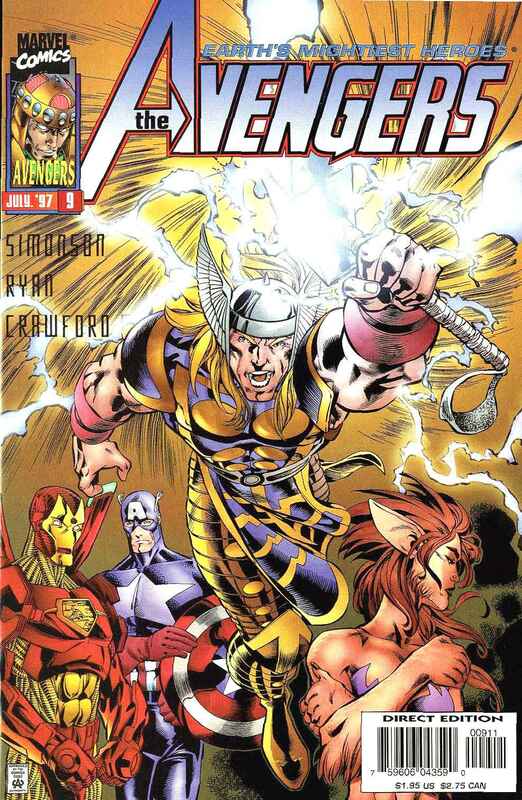 Thor learns of his counterpart's new villainy, and leaves to confront him, even as the Scarlet Witch arrives in Avengers Mansion. Cap reveals that she never really turned evil... but she leads Hawkeye - now in a purple costume - to attack the Captain. Evil Thor and the Enchantress also appear, and a battle royale commences. Loki enters the gamma core and begins to absorb its reality-altering power. Loki, now a giant, betrays his team and begins to reshape the world into a new Asgard. As Ebony, Harkness destroys Hellcat and the Scarlet Witch regains control of her own body. The Enchantress and evil Thor side with the Avengers, and the Enchantress separates Harkness and Ebony. The Avengers and their new friends team together to destroy the gamma core, but fail. Loki continues to transform Earth, but is confronted by a giant Odin, who is drawing power from the Enchantress, the Scarlet Witch and Agatha Harkness. The Avengers enter the gamma core and begin to divert the energy out of the core. Loki destroys Odin, who is revealed to be the "evil Thor". Loki then attacks the Avengers, but is delayed by the Wasp stinging inside his ear. He is delayed further by the SHIELD helicarrier's weapons. The remaining Avengers use the energy absorbed out of the gamma core to fry Loki. He is destroyed, but so was evil Thor, and Hellcat. A terrible price. 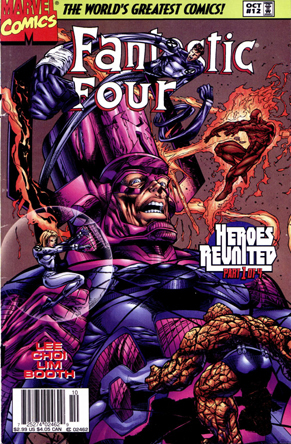 The Heroes Reunited crossover took place in Fantastic Four #12, Avengers #12, Iron Man #12 and Captain America #12 and dealt with the coming of Galactus. Dr. Doom arrives in New York, where he is briefed by several Doombots. They inform him that the Fantastic Four are trapped in combat with Terrax, Firelord and Plasma - three heralds of Galactus! Doom is pleased; he has a plan, and all is going according to it. The FF fight the heralds, and are eventually joined by the Silver Surfer, but the heralds are recalled by their master. SHIELD takes the FF to their helicarrier - already occupied by the Avengers - for a briefing: they've detected Galactus' ship on the opposite side of the moon. The Human Torch departs to warn the Inhumans, and is forced to face Firelord. The Avengers travel to Monster Island, where they confront Plasma. Galactus arrives on Earth, and SHIELD crashes the helicarrier into him - killing all aboard, including Fury and Contessa Allegra de Fontaine. Galactus begins to convert the world's energy, but Reed Richards completes an Ultimate Nullifier to use against him. Thor and the Thing confront Galactus with it, but Galactus defeats them - and turns the Thing back into Ben Grimm. Terrax then crushes the Black Panther and Grimm beneath a small mountain! Doom creates a siphon suit which he uses to absorb the heralds' powers and confront Galactus, but in the fight many of the heroes are destroyed and soon, Doom simply... vanishes! The Avengers are aboard the helicarrier, having just placed "evil Thor's" body on a boat and set it adrift. The helicarrier fires its main weapons at the boat, giving Thor a true Norse send-off. Suddenly, SHIELD Agent Clay Quartermain warns SHIELD that Galactus is coming! Just as suddenly, Dr. Doom appears on the helicarrier and warns the heroes of Galactus' earlier coming - it would seem Doom has travelled back through time, since the end of Fantastic Four #12. #12 - "Matters of the Heart"
In the FF's lab, the FF and Iron Man spy the approaching heralds. The FF volunteer to make first contact, as Tony Stark leaves to visit his injured friend, Happy Hogan, in hospital. While there, Doom attacks and forces Stark to go with him. He reveals to Stark that he clearly remembers the confrontation with Onslaught... and so does Fury! Doom, Stark, the Avengers, She-Hulk, Hulk and Leonard Samson assemble on the helicarrier, where Fury tells them the FF were killed by the heralds. #12 - "Let It Be"
Doom attacks Bucky in Philadelphia in order to draw out Captain America. He succeeds, and through their discussion we learn that the FF and several Avengers are already locked in combat with the heralds of Galactus. With Doom's help, the heroes defeat the heralds, and in space, Galactus begins to worry. The heroes gather to figure out a plan, and Banner suggests that they give Galactus exactly what he wants - energy! The heroes make more specific plans, and Bucky is confronted by the Silver Surfer. He tries to convince her to tell the heroes to give up, but instead she latches onto his board. Cap chases on a flying motorcycle, but Galactus zaps Bucky and causes her, and Cap, to fall into the ocean (in a scene very reminiscent of Bucky's death in the Marvel Universe). Cap saves Bucky, and the heroes finish developing an Ultimate Nullifier. The Silver Surfer decides to betray Galactus, and he joins the heroes. The Surfer takes the Nullifier and attacks Galactus - he uses Doom's siphon suit to channel the heroes' power through the Nullifier, overloading Galactus' internal energy conversion processes. The Surfer is destroyed, but so is Galactus. The World War 3 crossover spanned Fantastic Four #13, Avengers #13, Iron Man #13 and Captain America #13. The crossover dealt with a blending of the Heroes Reborn and Image Comics universes. However, the crossover deals with the transformation of individual heroes and is not integral to Avengers history, so only the Avengers issue will be outlined below. #13 - "Winning and Losing"
Reed Richards gathers the combined heroes of two universes together to discuss the threat at hand. Shape-shifting aliens - Skrulls - are invading, and they need to be stopped! They realise that to save both realities, they need to be separated - but before that can be done, the primary heroes, gathered aboard the Stormwatch satellite, are killed by the invading aliens. 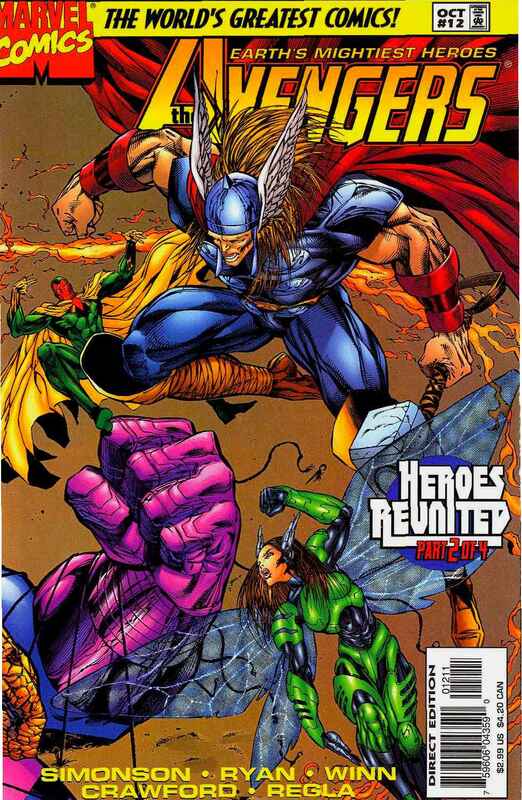 The Heroes Reborn storyline was finalised in a four-issue Heroes Reborn: The Return limited series, but like World War 3, the plot was a universe-spanning one and not an Avengers-specific one, so it will not be summarised in great deal. In short, the space gods known as the Celestials became aware of the existence of the Heroes Reborn reality and confronted Franklin Richards, telling him that either the Heroes Reborn world or the Marvel Universe must be destroyed. While he was able to alert some heroes and give them time to leave the Heroes Reborn world and return to their native universe, he could not find a way to keep both worlds alive - but his innocence and good nature convinced one Celestial, Ashema, to sacrifice her sentience in order to contain the Heroes Reborn world within her body. The heroes returned, but every other being in Franklin's world lived on through her. When the heroes returned, they left Doom behind. In a series of one-shots published several years after the event, Doom took control of the Heroes Reborn world and confronted Ashema, eventually extracting the world from the Celestial's body and transporting it to the side of the sun opposite Earth in the regular Marvel Universe. From that position, the world was easily accessible to anyone wishing to visit it, as the Thunderbolts and Exiles did years later. There are several theories attempting to explain what the Heroes Reborn universe actually was, but sparse evidence to support any of them. What we do know, through references in comic books since the event, is that the world was controlled by Franklin Richards' mutant powers and that when the heroes arrived there, they were recreated based on his memories of them. Whether the world existed before their arrival is unclear, and there is as much evidence to support the claim that it did as there is to argue against it. My theory is that the Heroes Reborn universe was, simply, Franklin's imagination, and that it existed long before the Onslaught disaster. While the primary characters are quite similar to those in Franklin's universe, the supporting cast is not, and the less Franklin was exposed to those characters the less similar they become. Some characters who he would have only encountered through snippets of overheard conversations between adults bear next to no similarity to their Marvel Universe counterparts. When the heroes sacrificed themselves to save Onslaught, Franklin wanted to protect them, so he simply remembered them as he wanted them to be - but when the Celestials interfered, he had to restore them to reality and put them in harm's way again. The heroes did die; just not in the heart and memory of one little boy. A goal was to drive up sales and pull Marvel away from bankruptcy. It succeeded. 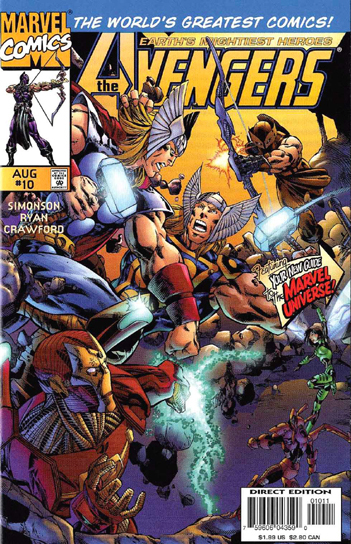 A goal was to renew interest in Marvel's long-running titles. It succeeded. A goal was to see if Marvel would be better served outsourcing its editorial duties. It succeeded in showing that Marvel's editorial team is the best is the business. An event that many people love to hate helped save a company from ruin - if that isn't success, I don't know what is.